Since bursting onto the underground black metal/noise/drone scene a couple of years ago, few bands have been as prolific as San Francisco's Sutekh Hexen. Three full-lengths this year - Larvae (Handmade Birds), Behind the Throne (Magic Bullet), and Empyräisch (just recently released by the excellent Vendetta), and now this CD, Breed in Me the Darkness, on Aurora Borealis, which features two Sutekh Hexen tracks, totaling just about 12 minutes. The CD also features those songs re-imagined, reworked, and completed by none other than the amazing musician and sound artist Andrew Liles. If you're not familiar with Liles highly varied works, you should check out his long discography of solo recordings and collaborations, as well as some of his remixes for bands like Current 93 and Nurse With Wound. It's safe to say that Liles is one of the most talented and visionary artists out there. The total run time on the disc is just about 45 minutes, and it's as intricate a 45 minutes as you will spend. 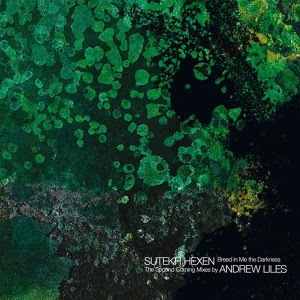 The Sutekh Hexen tracks on their own are impressive - "We Walked Upon These Coals" is perhaps closer to the (dark) ambient side of things than anything they've done previously, with little in the way of metal, while "Selling Light to Lesser Gods" is more in keeping with the sound of their black noise/drone recordings - but it's the "remixes" that really bring this home. These aren't the typical remixes; Liles has added plenty of his own music on to these two tracks, and wonderfully so. "Attention to detail" is an annoying buzz-term, but it is certainly applicable here. While it's easy to imagine the two tracks being dragged out farther than they should be, Liles avoids that, working with just the right amount of space and restraint: they're wild and untamed, but not feverishly so. If you're a Sutekh Hexen fan, this is essential. I can't imagine a fan of the band's not liking this. Even if you're not a fan, check this out, and you may change your mind. While it has not been released yet, it is up for pre-order from Boomkat. Aurora Borealis (check out the link above) will make it available for purchase there once it's out. Should be very, very soon.